Lana's Fur Cleaning Kit consists of an optimal combination of natural solution and proper tools that gives you everything you need for safe and easy at home maintenance and renewal of fur garments. 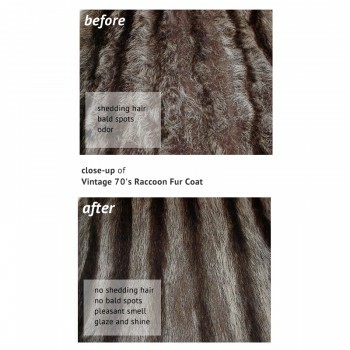 The kit allow you to keep fur's new look or regain the look it once had. It works well on all fur types: mink, fox, rabbit, lynx, sheep, coyote, sable, faux / fake fur, etc., and on any fur items: coats, hats, gloves, scarves, collars, purses, rugs, throws, wraps, seat covers, etc. In my opinion the product is very useful, and I was delighted by how simple it was to apply. Lana’s Fur Cleaning Kit is a three-in-one total fur care solution that cleans, glazes and eliminates odor from your precious fur garments. The kit can be used on a wide variety of fur items such as coats, hats, gloves, scarves, collars, purses, rugs, throws, wraps, seat covers, etc. This cleaning process and the solution is a family secret that has been used for over a century, and passed down from generation to generation. Now we are bringing this ancient Russian fur cleansing method to you so that you can show your fur the love it deserves. As an extra bonus we added two of our Moth Away bags filled with 100% natural ingredients. They’re perfect for protecting your garments from moths! The cleaning process should involve all parts of the kit, Lana’s Fur Cleaning Solution, Lana’s Fur Brush, and Lana’s Fur Pad. For complete directions please click here and follow our easy steps for fabulous results. qI have a fur coat that shows dryness; the longer hairs look shiny, but the short ones seem dry and like frizz or so and with a lighter color. Do you have a product that could make those spots look shinny again? 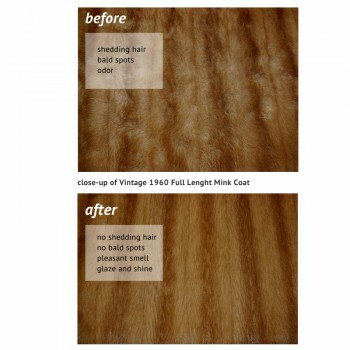 Dry and shiny look of your fur suggests that you need to restore glazing in the fur hairs. To fix the issue we recommend our Fur Cleaning Kit (LS-FNL-001). It is easy-to-use at home complete fur care kit that comes with detailed step-by-step instructions and includes everything you need to restore a good condition of your fur coat. We recommend to repeat maintenance procedure of your fur coat 2-3 times during one week. qI inherited a fur coat that has some strong, musty odors. I have had the lining and interfacing removed. The pelts are in great shape as is the actual fur. I would like to know if any of your natural cleaning solutions would address the odor issue. To eliminate the strong odor away from your fur coat we would recommend our Fur Cleaning Kit (LS-FNL-001) which is three-in-one product that cleans fur, removes odor, and restores glazing of fur hairs. Moreover, it also includes two complimentary moth away bags for continous protection when storing the fur. We recommend to repeat the coat care procedure 2 to 3 times during the week. If you feel that your coat requires additional anti-odor treatment, we would recommend our other fur odor removal solution which is also easy to use, please read our guide on how to remove strong odors from fur to learn more. qI need a solution to clean my used furs purchased on eBay so that they smell newer and fresher. Which of your products will be the best for this purpose? For odor removal and refreshment of old furs we recommend using our Fur Cleaning Kit (LS-FNL-001). It is all-in-one product that not only cleans the fur but also removes odor thanks to the solution's formula that already includes odor eliminating substance. To get better result repeat the refreshment procedure 2-3 times during the week. In addition to cleaning, for furs with strong odor we would also recommend to try our Fur Odor Remover. qI am a professional Santa Claus and need to clean a few white Fox fur headbands. Is there anyone I can talk to to determine which products to use? Lana’s Fur Cleaning Kit (LS-FNL-001) is the right way to go. It is easy to use and will clean your headbands very well. Also, if you really want those headbands to shine like new you may use our Fur Whitener Kit (LS-FNL-015), which is also available on our web site for ordering. These are separate products and both do different things. Lana’s Fur Cleaning Kit will clean and freshen the headbands. and the Whitener Kit will make your headbands white as if they were brand new. qI purchased Fur Deep Cleaning Kit recently and followed the procedure as described, a strong odor of perfume is less but still there. I tried it 2nd time and disposed of the cleaning product, but still odor prevails. Let me know what you recommend? The reason for the smell is that Lana’s Deep Fur Cleaning Kit (LS-FNL-029) does not contain odor remover. The product you are looking for is Lana’s Fur Cleaning Kit (LS-FNL-001) which has the odor remover in the solution and which we do sell separately. Since you purchased the kit that already includes a fur brush, all you need is Lana’s Fur Cleaning Solution (LS-FNL-002) which is available for ordering on lanasfur.com. qWe got blood all over the Blue Fox coat. Will your cleaner work on blood? Lana’s Fur Cleaning Kit (LS-FNL-001) does work on blood stains and should clean most if not all of the blood. If there are any spots remaining, you can try our Fur Whitening Kit (LS-FNL-015) as it is a bit tougher and intended for white furs. 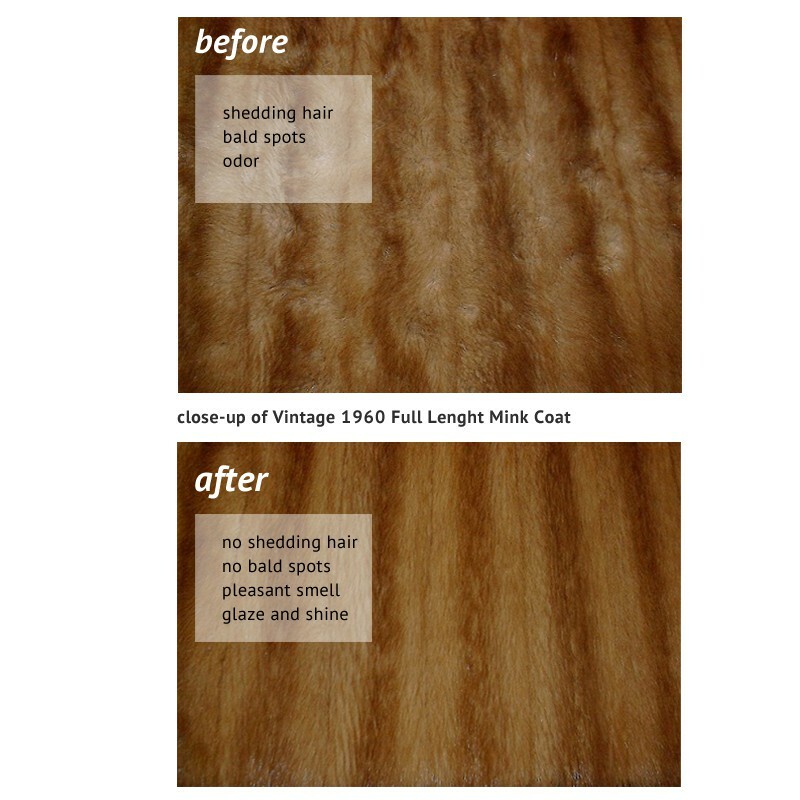 qWill your fur cleaner work on vintage faux fur or only real fur? I got a jacket at a flea market that is faux fur but the label says to clean by furrier method only. Our Fur Cleaning Kit works for a faux fur maintenance and renewal very well. The bottle of Lana's Fur Cleaner is enough for three full length coats, so for your jacket you won't need a refill for more than two seasons. If you decide to try it, we suggest to be extra careful with brushing of your vintage faux fur because the exact age and type of faux fur material of your jacket is unknown. 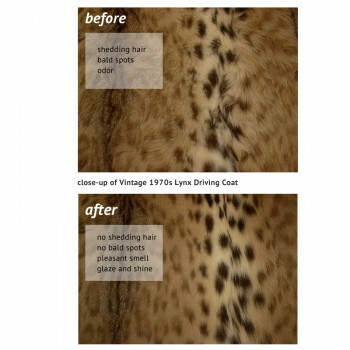 For easy step-by-step tutorial please visit Lana's Fur Cleaning How-To. qI have furs that need cleaning, what is your most popular fur cleaning product? Our most popular product for fur cleaning is Lana’s Fur Cleaning Kit, it's a combination of natural ingredients, ideal for quick and easy regular fur maintenance and renewal at home. The kit allows your fur to keep its new look or regain the look it once had. 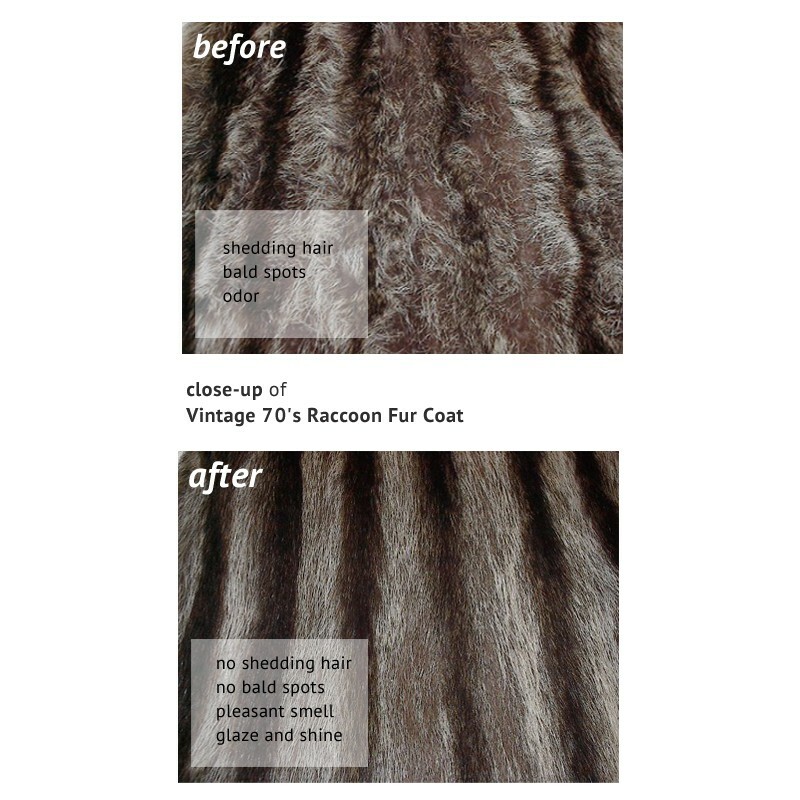 The kit works well on all fur types: mink, fox, rabbit, sheep, coyote, sable etc., and on all fur products: coats, purses, scarves, rugs, throws, wraps, hats, seat covers, etc.